Last week, DAX30 CFD bulls finally pushed through and reconquered the SMA(200) on a daily time frame, landing back above 12,000 points. This arrived followed by hopes of a coming solution to the trade conflict between the US and China, and a weaker Euro stabilising only slightly above 1.1200. From a purely technical standpoint, the mode looks a little extended on the upside and a consolidation, probably a short pullback towards 11,800/830, a little lower towards 11,700 points in the upcoming days seems to be favoured, while on the other hand the way up to 12,500 points is levelled. Nevertheless, despite all the optimism, one should definitely be careful: with time running out in regards to the Brexit deal, a no-deal scenario became very likely over the last week. And if no deal between the EU and the UK can be struck by Friday, a sharp drop in the DAX becomes a serious possibility. In general, the picture looks very similar to the DAX30 CFD in June 2016, the week before the initial Brexit vote, where the DAX gained nearly 1,000 points or 10%+ the days before the vote, only to drop over 1,000 points and more on the day of. Such a scenario is once again a possibility, and should be taken into account when engaging in the current bull run in the German index. Source: Admiral Markets MT5 with MT5-SE Add-on DAX30 CFD daily chart (between November 23, 2017, to April 5, 2019). Accessed: April 5, 2019, at 10:00pm GMT - Please note: Past performance is not a reliable indicator of future results, or future performance. In 2014, the value of the DAX30 CFD increased by 2.65%, in 2015, it increased by 9.56%, in 2016, it increased by 6.87%, in 2017, it increased by 12.51%, in 2018, it fell by 18.26%, meaning that after five years, it was up by 10.5%. Check out Admiral Markets' most competitive conditions on the DAX30 CFD and start trading on the DAX30 CFD with a low 0.8 point spread offering during the main Xetra trading hours! 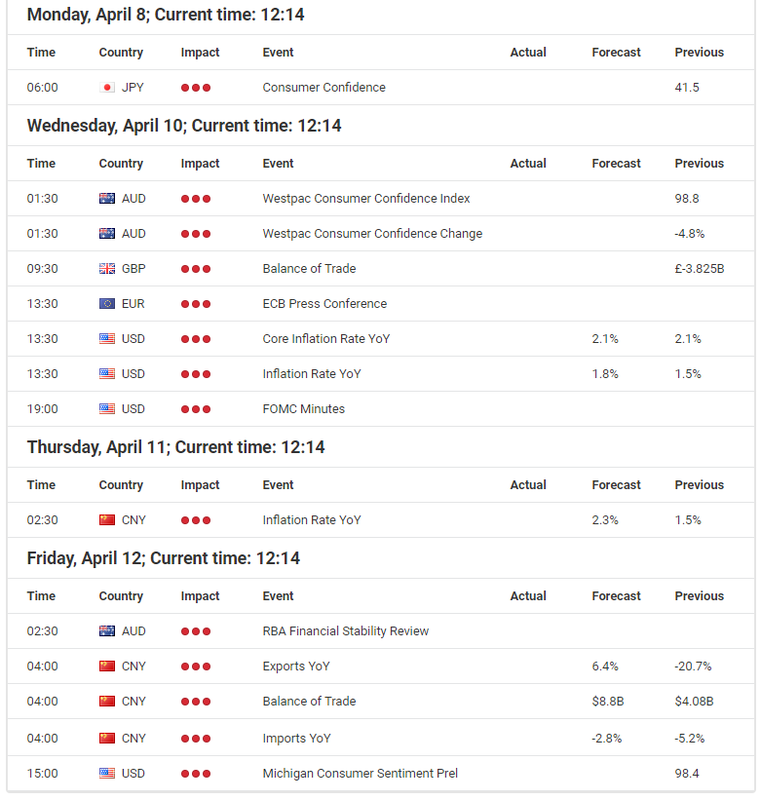 While our overall scepticism towards the US dollar is still ongoing after the dovish Fed report on March 20, the stabilisation of 10-year US Treasury yields and solid economic data for the US economy over the last week, paint an optimistic picture for the coming days. We should take care to watch the stabilisation in US yields as they could start to shift, particularly if speculation grows around the uncertainty of the trade conflict between the US and China as it is currently holding business back, as markets await a deal to be struck. On the other hand, we should remember that the US dollar could see some heavy selling if a trade deal is struck, since China, but also regions like the EU or Japan, would not face any pressure to weaken their currencies against the dollar to counter any negative effects of tariffs on their exports. Don't forget to register for the weekly webinar "Admiral Markets' Weekly Market Outlook" with Jens Klatt, every Friday at 12pm London time! It's your opportunity to follow Jens as he explores the weekly market outlook in detail, so don't miss out! The price action in the Euro has been subdued over the last week of trading, with the EUR/USD currency pair still trading slightly above 1.1200. Interestingly enough, the solid US economic data looks to be interpreted as positive, but not positive enough to initiate a break lower in the EUR/USD. But, over the next few days, enough potential trigger events are on the agenda, such as the ECB rate decision on Wednesday. While it seems difficult to see any change in the rhetoric of the central bank in terms of rates or the plans to issue new TLTROs in the second half of 2019, it will be interesting to see how advanced talks are in regards to tiered rates for European banks. As discussed in our last weekly market outlook, a decision like this from the ECB would clearly signal that rates would stay low for a very long time to come, and contrary to the currently expected first rate hike at the end of 2020. It would leave the Euro vulnerable to a significant downward drop. If this happens, an initial target can still be found in the region of the duplicated range between 1.1200 and 1.1500, around 1.0900/0950. Source: Admiral Markets MT5 with MT5-SE Add-on EUR/USD Daily chart (between November 29, 2017, to April 5, 2019). Accessed: April 5, 2019, at 10:00pm GMT - Please note: Past performance is not a reliable indicator of future results, or future performance. In our last weekly market outlook, we pointed out that, despite the drop in 10-year US Treasury yields and the uncertainty surrounding Turkey and their collapsing currency which has the potential for a spill-over effect on other emerging markets, the Yen couldn't reach a profit. Beginning a week ago last Monday, with an initial stabilisation of 10-year USTs, the USD/JPY pushed back above 111.00 and has the potential to mark new yearly highs in the coming days, especially if a trade deal between the US and China is finally struck. But despite the optimism, chances of a no-deal Brexit has risen significantly over the last days, and if no effective deal is found by Friday, April 12, the JPY could see some heavy capital inflows due to an unwinding of carry trades. If the expected rise in volatility comes with a drop below 109.70, a dynamic push down to around 108.50 seems very likely. But, before this scenario develops and becomes a reality, the bullish outlook for the USD/JPY remains intact. And if the USD/JPY bulls push the currency pair back above 112.00, further gains up to 114.50/115.00 becomes an option. Source: Admiral Markets MT5 with MT5-SE Add-on USD/JPY 4-hour chart (between January 12, 2019, to April 5, 2019). Accessed: April 5, 2019, at 10:00pm GMT - Please note: Past performance is not a reliable indicator of future results, or future performance. In 2014, the value of USD/JPY increased by 13.7%, in 2015, it increased by 0.5%, in 2016, it fell by 2.8%, in 2017, it fell by 3.6%, in 2018, it fell by 2.7%, meaning that after five years, it was up by 4.1%. With the ongoing stabilisation of the 10-year US Treasury yields over the last week, and rising speculation of a trade deal being struck in the near future between the US and China, Gold wasn't capable of reconquering the level of 1,300 USD. That said, it's becoming more likely that the precious metal will go for a significant test of the region around 1,275/277 USD in the coming days. If a downward break happens, further losses down towards 1,240 USD becomes very likely, and the head-shoulder formation in the chart below will most likely play out. However, we want to remember what we said regarding the DAX30 CFD above: with time running out in terms of a Brexit deal, a no-deal scenario is increasingly likely over the last week. If this really happens, the resulting volatility and uncertainty would definitely favour Gold in the short-term, with a sharp rise back above 1,300 USD where we would quickly see further gains up to 1,320/330 USD. Source: Admiral Markets MT5 with MT5-SE Add-on Gold Daily chart (between January 14, 2018, to April 5, 2019). Accessed: April 5, 2019, at 10:00pm GMT - Please note: Past performance is not a reliable indicator of future results, or future performance.